A Voice for Kanzas by Debra McArthur. Review: Do you like a book that has a plot set in the past? Do you want to know what it's like to have to hide things from your family? Then A Voice For Kansas written by Debra McArthur is a perfect choice. 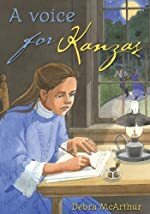 A Voice For Kansas is about Lucy moving to Kansas in 1855 and finding Annie and Levi, a local Indian boy and a girl who helps runaway slaves. When she discovers the liberty line, a she also tries her best to help free the slaves. Meanwhile Kansas is having trouble with outsiders making it hard to become a free state. Will Kansas fall into the wrong hands? Will Lucy fail to help? Read this book to find out. The characters wrap the book up with amazing plot twists. Some of the characters I loved and some I hated. The book is set for anyone 8 years old and up because of the vocabulary. The story is easy to read because the writing helps the plot create wonderful pictures in my mind. This book deserves five stars because I've never read anything like it. We would like to thank Kane Miller Books for providing a copy of A Voice for Kanzas for this review. Have you read A Voice for Kanzas? How would you rate it?